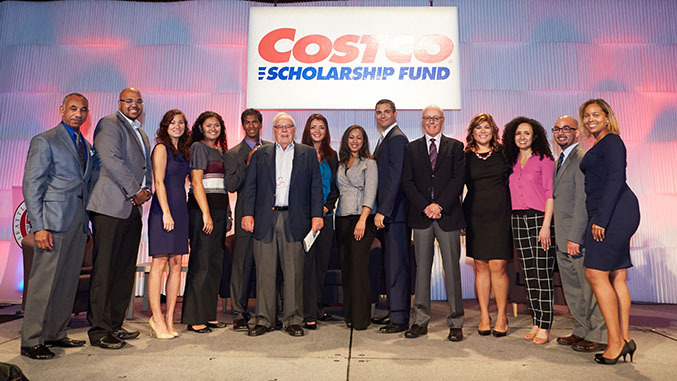 Philanthropic executives and Costco Scholar Alums gather to celebrate leadership and raise scholarship funds. From Left to Right: Art Jackson, Costco Executive; Jared Watson; Mary Rodriguez; Chalia Stallings-Alailima; Dr. Chris Holder; Jim Sinegal, Co-Founder of Costco; Norma Cuevas; Candice Richardson; Dylan Munn; Jeff Brotman, Costco Chairman; Analisa Castaneda; Vanessa Castaneda; Brandon Knight; Turquoise Young. A great mentor once told me that using our unique talents to benefit others is where you find your purpose. I recently had the privilege of planning and producing the 15th Annual Costco Scholarship Breakfast that raised a record $3.6 million dollars for student scholarships. The funds are distributed to nearly 300 Costco Scholars at the University of Washington and Seattle U who exhibit academic excellence and have a financial need. Costco Scholar Alumni (pictured above) who have gone on to great careers as doctors, lawyers, etc. spoke before an audience of 1,100 people that included Bill Gates, Co-Founder of Costco Jim Sinegal, Costco Chairman Jeff Brotman, and all current Costco Scholars.